The Federal Highway Administration estimates that red light running causes more than 100,000 crashes and 1,000 fatalities annually and results in an estimated economic loss of over $14 billion per year in the United States. In Iowa alone, a statewide analysis of red light running crashes, using crash data from 2001 to 2006, indicates that an average of 1,682 red light running crashes occur at signalized intersections every year. As a result, red light running poses a significant safety issue for communities. Communities rarely have the resources to place additional law enforcement in the field to combat the problem and they are increasingly using automated red light running camera-enforcement systems at signalized intersections. 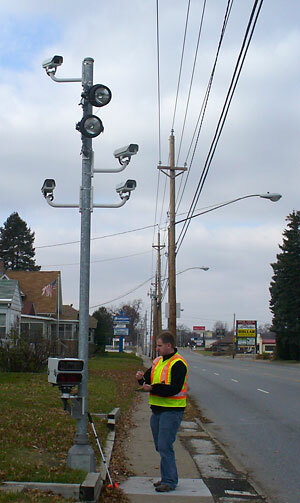 In Iowa, three communities currently use camera enforcement since 2004. These communities include Davenport, Council Bluffs, and Clive. As communities across the United States attempt to address red light running, a number of communities have implemented red light running camera enforcement programs. This report examines the red light running programs in Iowa and summarizes results of analyses to evaluate the effectiveness of such cameras.